Following closely after the Tehran Conference, Churchill and Roosevelt met once again in Cairo, at what would be the Second Cairo Conference. It started this week in the war, on 4 December 1943. 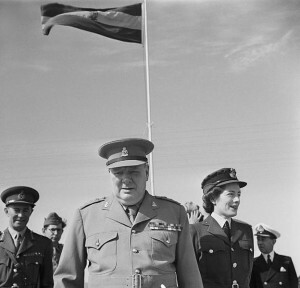 On the drive from Cairo to the pyramids, Roosevelt told Churchill about the final decision for the choice of Commander-in-Chief for Operation Overlord, the Allied invasion of northern Europe. Roosevelt said that he had decided that General Marshall would remain in the United States and that Eisenhower would command the invasion. This entry was posted in World War II and tagged Churchill, Ismet Inonu, Roosevelt, Second Cairo Conference, Turkey. Bookmark the permalink.